Divine Amalfi, LLC has teamed up with our friend, Cooking with Nonna's Rossella Rago, who shares the same love and passion as we do for Italy. Beginning June 29th to July 6th, join us in Campania as we expose the unique flavors of volcanic soil and the rich history, culture, ancient sites and picturesque landscape that grace this region of Italy. As we travel around the Amalfi Coast, you will witness for yourself why Campania was regarded as a place of culture by the Roman emperors. 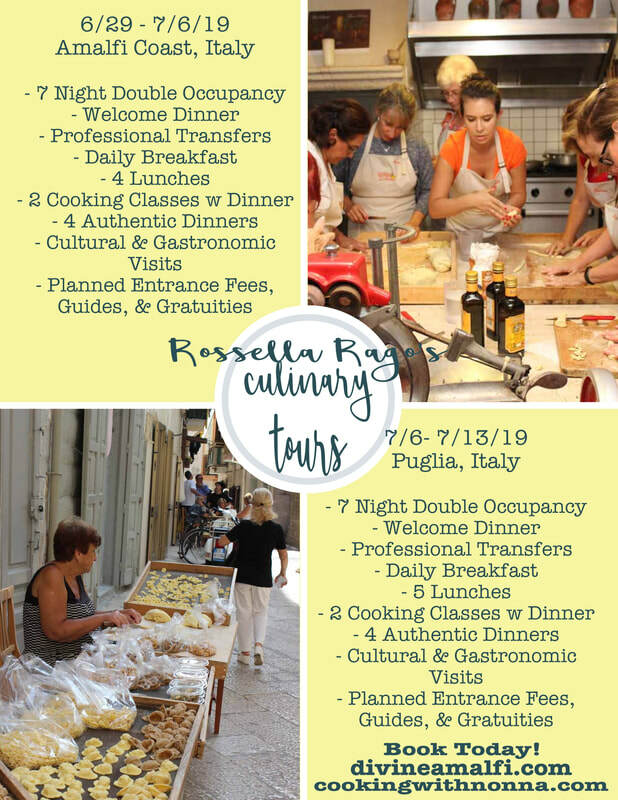 The following week (July 6 to the 13th), we will take you to some of the most traditional locations of Rossella's home region of Puglia, where you will be able to witness the creations of it's signature foods.